Denver, CO, October 08, 2018 — Sarah Cannon Cancer Institute at Presbyterian/St. 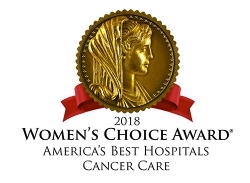 Luke’s Medical Center, part of HealthONE, has been named one of America’s Best Hospitals for Cancer Care by the Women’s Choice Award®, America’s trusted referral source for the best in healthcare. The award signifies that Sarah Cannon Cancer Institute at Presbyterian/St. Luke’s Medical Center is in the top 9% of 4,812 U.S. hospitals offering cancer care services. A hospital must be designated by the American College of Surgeons’ Commission on Cancer Classification (ACS CoC) as one of four specific types of cancer programs to be considered for the award. The Women’s Choice Award measures hospitals on the presence of specific cancer-related services offered onsite, infection rates and patient recommendation ratings on the Hospital Consumer Assessment of Healthcare Providers and Systems (HCAHPS) Survey. The award is unique in that criteria also include primary research about women’s healthcare preferences. Accreditation required for the award ensures that a hospital or facility offers a full range of diagnostic and treatment services, or provides integrated cancer care and comprehensive services. Passi emphasized that Sarah Cannon Cancer Institute at Presbyterian/St. Luke’s Medical Center and all 2018 America’s Best Hospitals for Cancer Care deliver on the care that matters most to women. “In addition to our award winners’ high-level performance on a national level, they provide the care that women value most, including easily accessible services onsite to avoid multiple trips for their treatment, which is so important to women faced with a cancer diagnosis,” stated Passi. Sarah Cannon Cancer Institute at Presbyterian/St. Luke’s Medical Center is one of 452 award recipients representing the hospitals that have met the highest standards for cancer care in the U.S. by the Women’s Choice Award. Sarah Cannon, the Cancer Institute of HCA Healthcare, offers integrated cancer services with convenient access to cutting-edge therapies for those facing cancer in communities across the United States and United Kingdom. Sarah Cannon’s cancer programs include individualized patient navigation provided by oncology-trained nurses, more than 1,200 stem cell transplants performed annually throughout the Sarah Cannon Blood Cancer Network, hundreds of clinical trials, and molecular profiling capabilities. Through its services, Sarah Cannon is providing state-of-the-art cancer care close to home for hundreds of thousands of patients, a number unmatched by any single cancer center. To learn more about Sarah Cannon, visit sarahcannon.com.